Our Lady of Confidence, Pray for Us! The first and most necessary sign of a religious vocation is that of a pure intention. A young woman must enter the convent with the intention of loving God more entirely, serving Him with greater devotion, and thus striving continually toward perfection. If this intention exists, she must determine which community God is calling her to by making inquiries, visits, and prayerful consideration. At this point in time, the woman is considered an Aspirant. ​ An aspirant who is considering a vocation to our community is invited to contact the sisters. We welcome your questions whether they concern our community or the possibility of a religious vocation in general. After some communication, the aspirant may be invited to visit our community for a time. During this visit, both the aspirant and the community try to determine whether the vocation exists, and whether the vocation is in harmony with the charism of this religious house. ​and a heart full of determination to try her vocation as a Sister of Our Lady of Reparation. ​The Candidate Becomes a Postulant. The Postulant has not yet been granted the holy habit, but instead is clothed in a white blouse, a black jumper, a simple black veil, and the medal of Her Holy Father, Saint Benedict. She anticipates the day that she will receive her religious name as a bride of Christ, therefore the title of Sister is placed before her baptismal name. The Postulant will spend the next six to nine months becoming acquainted with the basics of community life, and the spirituality of the house. The Postulant is free to leave of her own accord at any time during this phase of formation. The community is also free to dismiss her at any time during the Postulancy. ​The Postulant Becomes a Novice. Having completed the period of Postulancy, and having received the community’s approval, the Postulant prepares for her Clothing day. She is clothed as a bride of Christ with beautiful wedding attire, and is privileged to pronounce her consent in striving for perfection. She receives the holy habit with a white veil, the crucifix, and her new religious name. She is now not only the spouse of Christ, but also a sister to Our Lady of Reparation, to whom she must unite by making reparation to Her son in the Blessed Sacrament. The novice will spend the next year in silence, during which she attends classes concerning religious life, the Holy Rule, and spirituality. During the second year of the novitiate, she will be introduced into the active life of the community. The Novice if free to leave of her own accord at any time during the following two years. The community as well is free to dismiss her at any time during the novitiate. ​The Novice Makes Her Triennial Vows. Having completed the two years of the novitiate and having received the approval of the community, the former novice is free to become a professed sister by making her triennial vows. During the ceremony, she publically professes to Jesus Christ, that with His grace she will observe obedience, stability, and conversion of manners to the best of her abilities for three years. The newly professed sister receives the black veil which distinguishes her as a vowed bride of Jesus Christ. ​The Sister Makes Her Final Profession. The sister makes her final profession. After having confirmed her vocation by years of testing and having received the approval of the community, the sister is free to make her final profession. The Spouse of Christ then fervently renews her vows for life, and receives the long-awaited wedding ring, reminding her that she must continue to strive for Christ-like perfection until death. 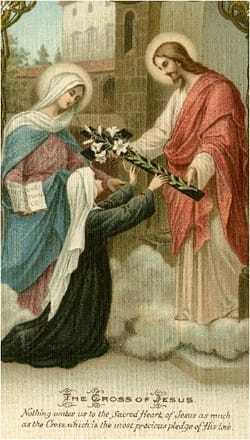 From henceforth, now, and forever she is the Spouse of Christ, and the Sister of Our Lady of Reparation. She has solemnly resolved to unite with her Blessed Mother, who is continually overwhelmed with maternal compassion for Jesus in the Blessed Sacrament. May the sisters of Our Lady of Reparation prefer nothing whatever to Christ, and may Christ bring them all together to life everlasting.